Hikers who are looking for something more challenging than a circular walk might be interested in the one-week hike from Hunsrück along Ausonius Way from Bingen to Trier. The nature of such a hike can be experienced in a day trip to the stunning Soonwald viewpoint. 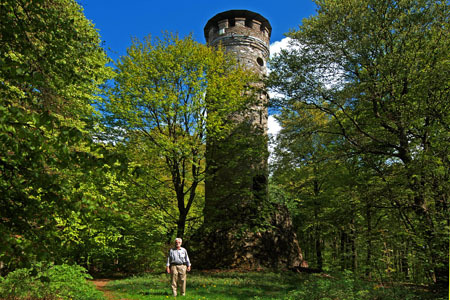 The trip is from the Nahe Valley, through the Soonwald foothills, up to the observation tower on Alteburg mountain, where visitors encounter the remains of a Celtic refuge. In the Latène Age (500 - 20 B.C.) such fortifications served the Celtic people in the surrounding area as protection against roving enemy tribes. We begin our tour as early as possible from Zollstock, the highest elevation in the Soonwald foothills on the road from Bad Sobernheim to Gemünden. Parking is provided for hikers a few kilometres from Nahe Valley. From Zollstock, walkers enjoy easy forest paths down to the 1000-year-old Willigis Chapel. This is close to the little village of Auen, where the legendary Hunter of Kurpfalz found his last resting place. From Willigis Chapel the path leads across the plateau past the vacated plateau of Pferdsfeld to the concealed Schinderhannes Cave in the Kieselbach valley. On the Schinderhannes trail we come to the forester's house of Entenpfuhl at the foot of the Soonwald main ridge. Near the small hamlet of Entenpfuhl is a memorial to the legendary Hunter of Kurpfalz. From the forester's house, we take the lonely Jäger-aus-Kurpfalz trail through the national forest up to Rennweg. From here, it is only a stone's throw to Alteburg. The observation tower of Alteburg offers a breath-taking, panoramic view over the Soonwald mountain range. After a well-earned rest, we reach the road to Gemünden on the European Long Distance Trail Nr. 3 (leading from the Atlantic Ocean to the Black Sea). We cross this to reach the ruins of Castle Koppenstein. The Castle's keep offers a panoramic view over Simmerbach Valley with Gemünden and the Hunsrück plateau. From here, it is only an hour's walk down into the valley. The special appeal of this day trip is the subtle transition from the gentle Nahe Valley into the more rugged Husrück Valley. Thus, this trip provides an excellent taster for a long-distance walking tour.